One of the truths I love most about travel is that as great as the better restaurants in the major cities often are, most often the best time to be had is wandering into the small little hole-in-the-wall place on a side street or the long-standing restaurant in the converted country house just beyond the last road in town that a local mentioned as good. Nowhere is this truer than in Italy, so much so that the same lesson can be applied to its cities. No one should die without seeing Rome, Venice, and Florence, but I have found that with them already visited, cities like Erbusco, Udine and Monforte d’Alba offer better return on your travel time than the more major cities. Italy is a very regional place and each region is unique. Larger cities there, like everywhere else, tend to draw from many regions and the world, creating a blended cuisine that, while universally appealing, is not necessarily unique. Smaller, less cosmopolitan cities tend toward a regional cuisine typical to the place, the tradeoff being that most often it is rustic dining with humble foods born of humble tradition reveling in their humility. Finding a fine dining establishment at this moment whose focus lies beyond foie, Kobe, and bluefin tuna is a true feat indeed. Amuse of porcini and tomato: porcinis and tomatoes that I suspect were roasted with herbs and puréed with olive oil. The result was an earthy, coarse emulsification with the metallic tinge of tomato paste that made me wish we had gotten a sparkler to start. La carne cruda battuta al coltello con tartufo bianco d’Alba: I try the carne cruda at every single restaurant because of how interesting the variations of the dish can be. Here it is as polished as it will get, hand chopped veal formed in a ring mold, drizzled with good olive oil which picks up the aroma of a pile of cinnamon colored white truffle that has been shaved over its top, with micro greens, pomegranate kernels and bits of Castelmagno garnishing. The meat itself is lightly sanguine and perfectly salted, the olive oil fruity, the Castelmageno wonderfully and unapologetically strong in pieces small enough to blend well and provide a lactic contrast to the meat’s richness, the pomegranate sweet and texturally opposed to the other components, the greens light and slightly astringent, and the truffle the kind you fly to Italy in October for. La cipolla ripena di toma di murazzano e salsiccia di Bra cotto al forno: this dish was not on the truffle tasting menu but is a house specialty that was well remembered from the honeymoon trip, so we requested it as a substitute for Wife’s raw meat course (she is on a brief raw meat hiatus). This is a light, tangy fondue made of aromatic local cheeses and strewn with bits of seasoned meat, collected in a roasted onion and roasted again at high heat. Because it was a substitute for a course on the truffle menu they were kind enough to top it with truffle in a shade of ecru. The resulting mélange was like a perfect version of southern American sausage gravy, except with light, zesty cheese aromas as opposed to simple milk (it now occurs to me that white gravy may be a good way to get more truffle in my egg dishes, a dilemma I am continuously facing). L’uovo in camicia con fonduta di toma d’elva a tartufo bianco d’Alba: a gorgeous yellow fonduta in a covered bowl laden with white truffle. There are many cheeses in the Langhe region and all the ones that are used in fonduta make each version unique. Those made with toma tend to fall a little flat in my experience, but not in this case. Definitely mellowed, it still held nuance of its healthy aroma and sharpness of its lactic notes. Once the egg set in the center of the dish is stirred through, its brilliant orange yolk turns the dish a vibrant saffron color and you have what is almost undeniably the perfect vehicle for white truffle enjoyment. Gli agnnoloti del plin al burro fuso e tartufo bianco d’Alba: a savory meat stuffing with the slight tang of game in a dense chewy pasta envelope, simply dressed with butter and topped with taupe colored truffle. A respectable dish that I would never reject, though it was not necessarily in the league of fits-like-a-glove the other dishes inhabited with their truffle accoutrements. The dish was exceptional and made sense as unique and typical to the region, but the pasta outshone the truffle in this paring. Il filetto di fassone con la cappella di fungo porcino e tartufo bianco d’Alba: tornadoes of filet mignon, seared and topped with roasted porcini caps, dressed with demi-glace and topped with a snowy white truffle. These were sided with a skewer of autumnal vegetables draped with the thinnest strip of pancetta, and a square of polenta topped with a thick oleaginous mixture that, although on the stranger side of the texture spectrum, was as thick with the foresty flavor of mushrooms as its consistency suggested. Cheese: a world-class cheese cart was presented and I deferred to the woman pushing it to choose five from the area, each more pungent than the next, and she did, well. A mini crème brulée was served for its appropriate bit of sweetness at the end of the meal. Dessert was a puff pastry tart full of apples and apple brandy that I had in the place of chocolate soufflé. Nice and light, it suffered from so much sugar caramelization that it was more caustic than anything else. We washed this feast down with a bottle of ’97 Giacamo Conterno Monfortino, followed delightfully by a magnum of the ’93. In America I would be terrified to open these gems so early in their maturation (Barolo traditionally made as this is I find best saved), but while wandering around the mile or so between the Conterno vineyard and this restaurant we learned that these two vintages are drinking well at this time, in this, their place. 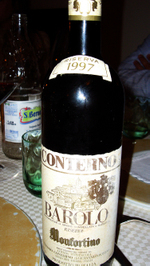 They were both beautiful – vibrant, elegant and youthful, with austere red fruit and soft, mature tannins. 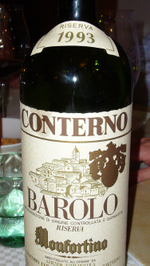 It could just be they are best suited to the food of their region, could be they taste better breathing the same air the grapes expelled on the vine, could be we were on vacation and relaxed enough to forgive the bawdiness of premature Barolo opening. No matter what, this was one of those meals where the food and the wine were in perfect synergy. More often than not, as humble food is refined it ends up losing its roots to some degree. 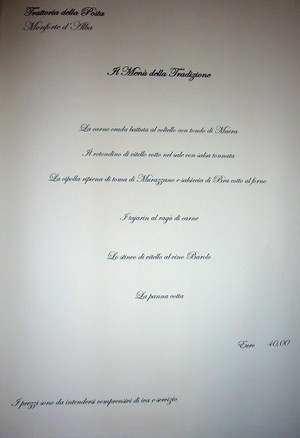 Provincial cuisine tends to trade a certain integrity when it aspires to a global standard of fineness, making a place offering food at a top level, unlike that to be found in the closest city to the region or the major-metropolitan cities of the world, a exceptional find in the gamut of food. This is the perfect meal for celebrating the wealth of products indigenous to and better in this area which keep drawing us back across the ocean. 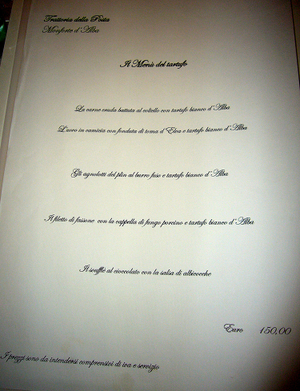 A version of everything we had is available in almost every restaurant in Piemonte. Good sense and long tradition have made these the dishes available because they showcase the indigenous product as well as can be done. Without turning to the indistinct food of the fine dining world, but offering fine dining all the same, this restaurant a couple of kilometers from the center of town in Monforte D’Alba sits right at the crossroads of rustic and haute. Della Posta produces food of the utmost quality and precision without ever losing a sense of its localness, and this is reason enough to make the trek.